The Cub Cadet Man has been collecting Cub Cadets for many years. What started as finding the best, most reliable riding mower to mow several acres of land has now become a considerable hobby. The collection of Cub Cadets has grown over the years to include many of the early models including the 70, 71, 72, 73, and early 100 series. The “Cub Cadet Museum” (as friends and relatives like to call it) contains numerous Cub Cadets in various states of repair and restoration. Besides collecting and restoring, the Cub Cadet Man also enjoys modifications and accessories. 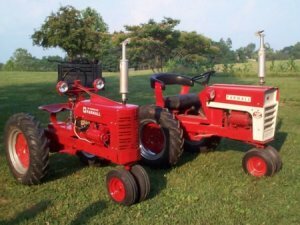 Among the modifictions are the two “Farmall” tractors shown at left. Accessories range from homemade, scaled-down rakes to vacuums to trailers and lifts. With this site, the Cub Cadet Man hopes to bring a little of the knowledge and experience (that has been shared with him by the Cub Cadet community and earned through hard work) with others that share his interest. Questions that he commonly sees asked in forums and at events may well be answered in the How-To section. Photos of his modifications and collections can be found in the photos section. The Cub Cadet Man likes travelling around the Midwest visiting tractor shows. You may even see him at Plow Day or at Thresherman Park in Boonville, IN. As always, if you have any questions, just click on “Contact Us” and ask away! And enjoy the site!